I’ve always thought coffee is ridiculously expensive. Every time I step into my favourite coffeehouse, the burst of aroma will make my mouth water - and I’d automatically reach into my pockets. Then I’d savor every sip of my favourite chai latte and think how ridiculously expensive it is, and how I’m a slave of my temptations. This feeling weighed me down, until I learned my way into the art of coffee-making. One major step of this art is frothing and doing it right is the turning point of whatever the coffee you’re brewing. To perfect this step, you need to buy yourself the best milk frother that’d suit your needs. While our review will help you locate the ideal frother as we’ve shortlisted the hundreds of frothers on the market, our buying guide will help you figure out what your needs/requirements should be. Scroll down and figure them all out! Here is a quick comparison chart that'll help you choose the one that fits your needs. Let's delve into the reviews of milk frothers one by one. Let it be coffee, hot chocolate, cappuccino or Chai Lattes - here’s the machine born to bless your taste buds! It brews both hot and cold frothed milk, that’s very smooth, silky and consistent - while allowing you to adjust the temperature and the amount of foam as you see fit. Made up of durable stainless steel as opposed to plastic, the machine is a beast in the longevity department. It’s a beauty to look at as well, and you won’t have the heart to lock it up inside a cabinet. Simple to use, easy to clean – there’s hardly anything that could go wrong with the Breville Milk Cafe Milk Frother. It’s dishwasher-safe too, and the parts are easy to dissemble. If you don’t own a dishwasher, then you can still wash it by hand without a hassle as the parts need only a rinse or two to be cleaned. It clocks in at 6 x 6 x 10.2 inches – quite big, yes, so get your countertop measurements right. Additionally, watch out for the minimum 1-cup milk requirement. If you prefer your drink to be made from less than 1 cup of milk, then I’m afraid, this might not be the one for you. Unlike most frothers, Breville Milk Frother can serve up to 3 cups at a time and it’s known to be a favorite among the hot chocolate lovers as it can fix an amazing cup with whole chocolate chips! 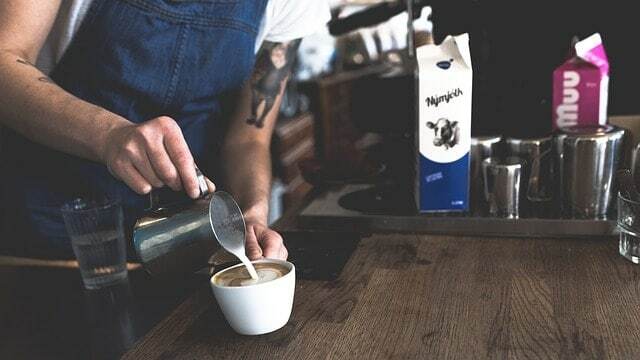 If price is the reason that’s holding you back, be rest assured that Breville Milk Cafe Milk Frother will give you the best bang for your buck. After all, this is going to be an investment worth making, and will last for quite a long time. Fixing a joyous cup every morning before you rush to work is a challenge like no other. That’s why the Nespresso Aeroccino is loved by many. It’ll help you beat this challenge by preparing the frothiest milk, in just under a minute! However, it won’t be enough for more than 2 people at a time. If you’re in the mood for a big mug, you’d need two cycles to have it fixed. It’s not all too bad, given the speed of the machine. Both hot and cold froth is possible with this machine. But there’s no temperature control. I don’t actually believe that it’s a deal breaker, but it’s a fair warning for those who prefer accurate temperatures to make specialty drinks. I won’t be surprised if the price tag gives you second thoughts. But hey, the best things are never cheap! Nespresso Aeroccino is living proof that a jug-style machine is often the easiest to operate. Designed with care, built with strength, it might even outlive you. I’d not hesitate recommending it to anyone especially because it nearly has no flaws. Kuissential Slickfroth 2.0 is a hand-held electric milk frother. It is inexpensive compared to the pricey models on the market with all the bells and whistles, but performs just as well. The body is as basic as it could ever be, with only a whisking head attached to a stem and a handle to hold the entire unit in place. Everything, except the handle is made up of durable stainless steel. Only a rinse with soapy water is enough to get them cleaned. All you need is to trigger it awake with two unprovided AA batteries, and hold it into a canister with milk. The canister doesn’t have to be of any special brand, just make sure that it’s tall enough to avoid the milk from over-spilling. As you insert the frother into the milk, you’d feel how powerful it is, especially if you’ve owned a similar unit before. The foam it gives rise to, is creamy and smooth – just the perfect texture for a delicious cup, whether it be specialty coffees, hot chocolates, milkshakes or more. When it comes to longevity, the size and weight might dampen your hopes. But under proper everyday handling and care, it may even have more than a 2-year lifespan. And for the price, there’s simply nothing more to ask for! If the price is the first thing that matters, then look no further, Kuissential Slickfroth 2.0 is the best the market has to offer. It does only the basic function of frothing, but does so without a hitch. If you’re on a budget, and battery-powered, handheld frothers are not the ones to impress you, then HIC Milk Creamer might just be the one. It, by no means, is a professional frother. But froths so well that you might as well ditch your favorite coffeehouse for life! 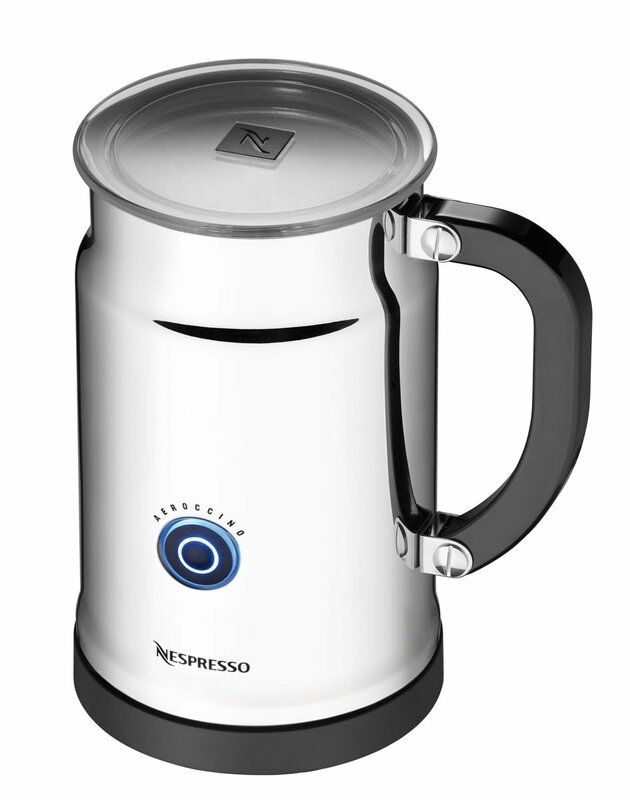 The pitcher it comes with is large enough to hold about 14 ounces of milk and is made up of durable stainless steel. You can pour in hot or cold milk, pump it with only minimal effort from your part – And whoosh! A thick, delicious, creamy topping will be ready in under a minute. The construction of the unit, as a whole, is quite good. It has no plastic to wear out or break, and the stainless steel helps you fix a healthy cup. Even though the screw that secures the handle has reportedly loosen off with time, it’s not something that screwdriver can’t handle. Cleaning the forther is no biggie. The mouth is wide, the handle is heat-proof, and comes apart easily! You don’t have to worry about a motor either. So just hold it under running water and it’d be ready for another round. Now if you’re a beginner to the art of handheld, manual frothing, then you need to be prepared to use this one because it has no instruction manual. Perhaps the manufacturers didn’t believe you need to be instructed, for the process can be done even with your eyes closed. 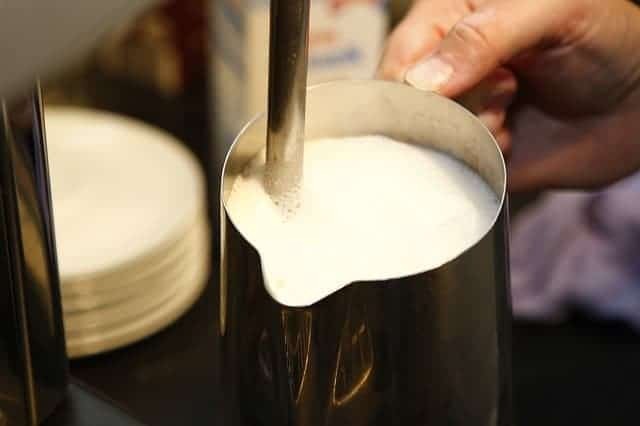 It’s true that HIC Milk Creamer Frother uses the old-school way to froth milk, but it matters not as long as it does a flawless job at it! Apart from the minor gripes mentioned above, it has no deal breaker. 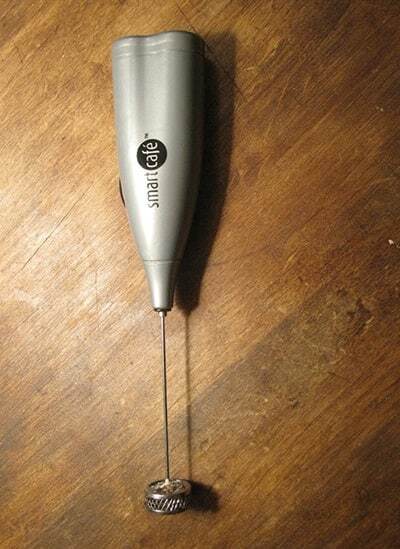 So if all you’ve ever wanted is a frother that won’t eat up your savings, then look no further, this is the one. In terms of the overall value, Silver Carafe Jug version of the MatchaDNA Handheld Electric Milk Frother is by far the best we’ve come across. It doesn’t cost an arm and leg, instead falls into a comfortable price zone than most coffee snobs can afford. Powered by electricity, it can hold up to one cup of milk. This isn’t a capacity that can serve more than 2 at a time. But given the price, and how easy it is to operate, I’m sure you wouldn’t mind running it a few times to serve everyone alike. It’s built pretty much well with a stainless steel body and a plastic handle that provides a solid grip on the unit. Once you pour the milk in, you can heat the milk and go about frothing it at the press of a button. Not only hot, but also cold milk is frothed exceptionally well by this machine. It’s creamy, consistent, and thick enough to spice up a variety of beverages from cappuccinos to hot chocolates and lattes. It also lasts – you don’t have to drink it down to keep up with the dissipation. Instead, sit back and enjoy your cup! On the downside, there aren’t actually any deal-breaking gripes. It’s easy to use, clean and store – and that’s about it. However get an extension cord ready. If not, with the provided cord, you’d have to place the unit right next to a socket. From a fairly-inexpensive price point, an electric frother such as the MatchaDNA Handheld Electric Milk Frother is definitely a steal. It functions exactly as advertised, and holds up to daily abuse quite well. For those of having a long list of beverages to try within the convenience of your home, this unit is hard to beat. Aerolatte Original HandHeld Milk Frother has many selling points, but the biggest one lies at its core function. It turns milk into a creamy and foamy froth – which is basically what all frothers do. But this one can do it to any type of milk, let it be soya, almond or coconut milk. However, it has no temperature control – which is quite common among all handheld frothers. But works well regardless of how hot or cold the milk is. If you want a hot froth, preheat and then insert the frother. This stainless steel unit, coupled with hard plastic base and handle will put your longevity worries to rest. Right out of the box you’d feel how robust it is even though it is small and relatively inexpensive. The batteries, in my experience, are something to note down. Though battery-operated frothers offer the convenience of portability, it comes at a cost and that’s in the form of batteries. You’d need replacements at least twice a month if you use it more than once every day. One look at Aerolatte is enough to give you the impression that it’s no ordinary unit. Built well, functions better and give you the best value for your money. Invest on it and call the money well spent. They say not to judge a book by its cover, but the first impressions always matter. PowerLix Milk Frother, at a glance, looks like a well-built handheld frother that comes with a black handle to complement any kitchen. It has a stainless steel body and whisk, advertised on an elegant holder which is shipped to you along with the unit. In short, it’s built to please. So now let’s get into the specs. It features a powerful motor powered by two AA batteries. Together they can spin the whisk at 19000 RPM – and froth your milk, both hot and cold, in less than 15 seconds! The froth quality is amazing and it doesn’t dissipate as soon as it’s formed like in most low-end models. Foamy, creamy, and smooth, it could be used as a delicious topping on a variety of beverages across many types of milk from almond to soy and more. Since PowerLix is powered by batteries, it’s portable too. You can even take it on a road trip. After all, as a coffee snob myself, I wouldn’t dare miss a delicious cup of cappuccino or latte – just because I hit the road! On the downside, however, PowerLix is advertised to be capable of handling anything liquid, including eggs. But results have proved that it bogs down, and isn’t as efficient as it’s with milk. So do not buy it expecting it to be multi-functional. If all you want is an entry-level frother that’d take your home-brewing experience to another level, then don’t hesitate to give PowerLix a go. It’s made well for the price, and comes with a convenient for easy storage. Look once and you’re ready to take the second look already! Yes, it’s a beauty and it’s used to a lot of attention not only because of how it looks, but also because of how it functions. No electricity or batteries are needed to power the Norpro Froth Master, which also ensures longer life because there isn’t any motor to burn. However, it features a glass beaker and that could be a deal breaker for many. It is strong and durable - yes, but requires careful use. On the bright side, however, glass makes the process transparent and you can enjoy the experience. What’s more, you can easily use it to directly microwave your topping/milk, without having to use another container to do so. To froth, the Norpro uses a plunging mechanism. You need to pour in not more than 16-oz of milk into the beaker and start plunging up and down for about 20 seconds. Don’t beat the thing to death, just do it with enough force to move through the milk. The resulting froth is similar to that of a high-end model, and it works well with both hot and cold milk alike. If you haven’t used a manual frother before, it might feel like Norpro Froth Master is taking forever to froth the milk. But be patient, and once you get a hang of it, you’d begin to like how cost-effective it is. If you’re on the market for a manual, glass frother that’d not only froth your topping to beat the flavor of your favorite coffeehouse, but also blend in perfectly with your kitchen, then Norpro Froth Master would make an ideal buy. It’s also the most durable and cost-effective glass frother on the market. Cheaper than the ton, Ikea Milk Frother 100.763.20 is a handheld frother powered by two AA batteries. It features a durably made plastic handle inside which the motor lies. The rest of the body is stainless steel and they are the only parts that come in contact with the milk. Like all handheld frothers, this one is easy to use as well. All you need is to pour the milk into a container and immerse the whisk into it. Follow the instructions on how to hold it while the motor spins the whisk at a frenzied speed. The topping for a variety of beverages will be ready in 15 seconds flat! The quality of the froth is the selling point of this Ikea Milk Frother. It’s thick, creamy, and long lasting. You don’t have to fear dissipation even before you start serving the drink. What’s more, it works well with both hot and cold milk alike. It lasts, though certainly not forever, it’d last for at least an year even under the conditions of daily use. However you need to handle it with care. Too much pressure can bend and break it very quickly. Also note that it’s a petite frother and you can’t expect it to froth a gallon of milk at a time. It does great only with small proportions so even if there are many in line to get their topping ready, do it in small quantities for better results. For those having realistic expectations given the price, I wouldn’t hesitate recommending the Ikea Milk Frother. It’s a cute, portable frother that can do a neat job at frothing the ideal topping to flavor your cup. As a buyer on the market to grab the best milk frother that’d suit your needs, it’s important to first understand what your exact needs are. Here’s a simple buying guide put together to help you get started. Milk frothers are mainly of two types; Handheld and Jug Style. As the name itself suggests, handheld frothers need to be held by hand as the whisk spins. They usually don’t come with a container, and are relatively inexpensive. Jug style milk frothers are the exact opposites of handheld units. They come with a beaker/container and a whisk. Most of them use induction heating and cooling elements so that you don’t have to separately heat or cool the milk. Price wise, handheld milk frothers are cheaper. They’re also lighter in weight, and if powered by batteries, portable too. Coffee toppings are not just limited to cow’s milk. The unique tastes of a wide variety of milk from soy to coconut, almond and hemp have become the favourites of the ton. While all milk frothers can perfectly froth cow’s milk, some struggle with the thickness, fat and the weight of the other types of milk. So do make sure the machine you buy is good at frothing your favorite milk. A warm layer of topping would be ideal on a cold day, but would you still prefer the same warmth in the middle of summer? It depends of course, and some milk frothers come with built-in temperature control to cater your requirements as you see fit. They can both cool down and heat up your milk, and all you need is to give the command by pressing the relevant button. Handheld milk frothers usually don’t come with this feature due to their low cost and minimalistic design. But you can still froth hot or cold milk buy changing the temperature separately. Quality matters but make sure your quality standards are realistic. If you’re willing to splurge a little, then seek a frother whose main material of construction is stainless steel. Glass is another option you can consider. Though fragile, it’d be a nice addition to any kitchen and careful use will certainly prolong the useful life. No matter what the main body is made up of, there’s certainly going to be plastic additions, especially on the frother handles and lids. The units that made into our list all have high-grade plastic components and we’ve made sure they don’t come in contact with the milk. If you’re new to the market of frothers, you’d be surprised how expensive they’ve become. Unless you’re careful, you’d end up paying an exaggerated price for additional features you don’t even need. So make your needs clear, and decide why you need a frother in the first place. Do you want it only to froth your milk, or heat and cool it down as well? Do you want it to fix certain beverages like hot chocolate at a professional level? The most basic ones are the manual and handheld frothers. Though they serve smaller quantities at a time, they’re more affordable and simple to use. Allow me to break the somewhat bad news without beating around the bush; handheld frothers usually don’t come with a warranty. And when they rarely do, they’re unsurprisingly a tad more expensive. Electric models, on the other hand, come with a limited warranty of average two years. Make sure you double check it before you place a buy. I came across two common mistakes people often did when they froth. Note them down and make sure you’d follow these tips to enjoy a perfect cup! Funny as it sounds, most of the gripes I’ve heard about some of the best milk frothers on the market come from those who actually don’t know how to froth! When you hold the frother and see a beautiful foam building – learn to stop. Over-frothing will kill the air bubbles that you just created, and doing it all over again will not get you anywhere. There’s a reason why manufacturers indicate a maximum and minimum capacity. If you cross it just so you could serve an extra guest, you’ll end up messing the entire process, and sometimes by damaging the frother too. It could be a little bit tricky to deal with handheld frothers that don’t come with a container as there isn’t any clear indication of quantities. But since they’re usually light and small, they can’t froth more than 5 ounces at a time. So froth milk in small batches, and give the frother a break if you froth back to back. This way, the motor wouldn’t overheat, and end up meeting an early death. In my opinion, frothing is the best and the most fun part of brewing coffee. Seeing the milk turn into a creamy and delicious foam within seconds is a joy like no other. Don’t dampen this joy by treating yourself with the wrong milk frother. Instead, take your own time, draft an imaginary frother in your mind, and buy the closest substitute. HELP! 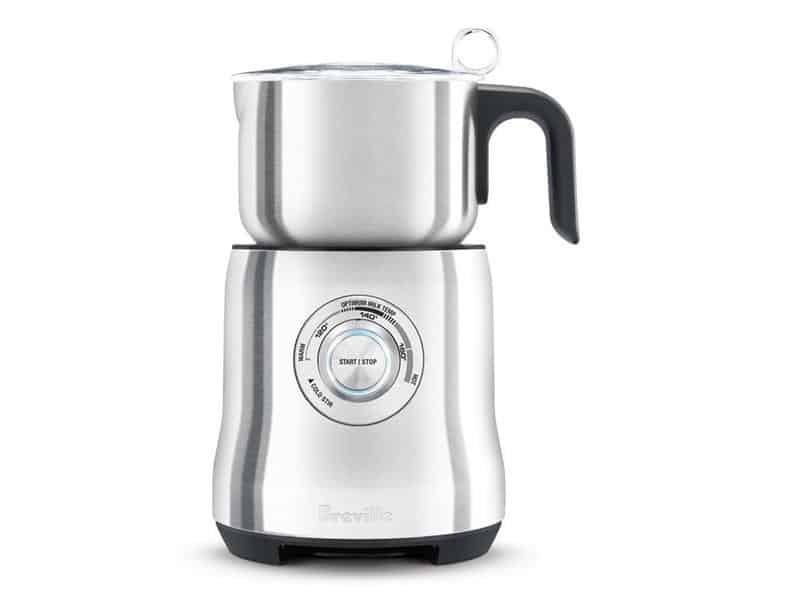 I would really like to to buy the Breville milk cafe brother. Amazon do not stock it in this country and I can’t find anyone in the UK who does. Can you tell me where to get this? Really appreciate some advice. Thank you.